Please note that some files may require the adobe pdf reader. Click here to download it. 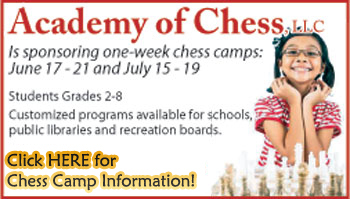 Academy of Chess LLC specializes in novice and beginner level players. Your instructor is Mr. Frank Procopio who is a Certified Chess Coach, US Chess Federation and has been teaching a formal chess program since 1990. Mr. Procopio also has his PA teacher certification in social studies, history, ecomomics and general science, with current clearances. Find the forms to join the chess club by hovering over the "How to Join" link on the left. Then click on "Regal Rooks Scholastic Chess Club." You will need the adobe reader in order to download and print them. Thank you.